A simple 1-2 hour walk starting and ending in Sella. From the Plaza Major, go down the steps of the Calle Major, follow the green and white waymarks which belong to the Ruta del Agua , down through the village, across the road and down the track opposite Toni´s bar to the main road. 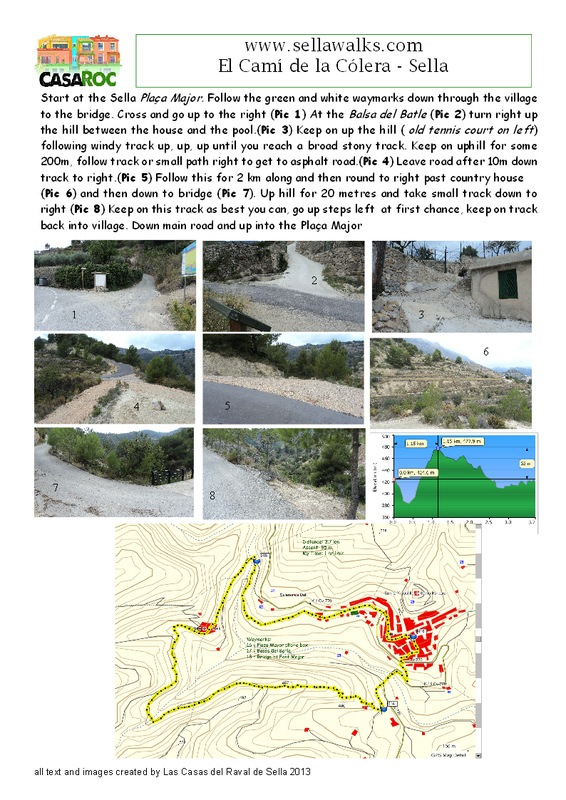 Follow it across the bridge and go up the asphalt track after the bridge to the right until you reach the Balsa del Batlle water deposit, – turn right uphill and follow the water for 50m until the track goes off right leaving tennis court left. Keep on up the hill, there are some purple waymarks – winding up through the scrub, join the bigger road, keep going and leave the new asphalted road after about 15 m to take a dirt track to the right. Follow for about a km around the valley head, through trees and almond orchards. Eventually you come down past the little house with a pool ( and dogs! ) to drop to the next track and then down to the bridge by the campsite. Go up the hill, visit the Pool Bar for a cold beer and then back down the main road to Sella.